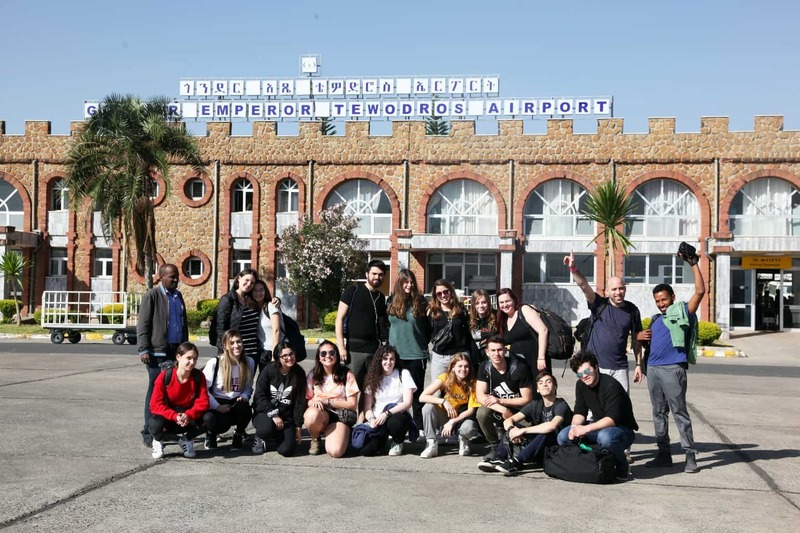 Ethiopia 2019 – On our way! Shalom from Ben Gurion airport! After all the airport arrangements, we are one step from boarding. We all are very excited to start our trip and explore the history and culture of Ethiopia. Today was a day that your children are sure to remember for the rest of their lives. We landed in Addis Ababa and straightaway took a domestic flight to Gondar. Before catching the flight, we had the chance to meet our trip organizer, Dejene Hodes, who graduated from the program and now runs heritage tours to Ethiopia. We landed in Gondar in a tiny airport, started our journey, and immediately began to experience some culture shocks (in truth these started as soon as we landed in Addis Abba). Just looking out the window at the mud-huts, tuk-tuks, the way people were dressed, and the number of people walking in the middle of nowhere was an extremely eye-opening experience. Our first stop was eating a traditional Ethiopian breakfast and checking into the hotel, which is a luxury, brand new hotel in the city! As soon as we were done, we headed to learn about Gondar’s history. We visit the Royal Enclosure of Gondar, which was the capital city for 200 years where each emperor built their own castle within the enclosure. We explored the castles, seeing something different in each one and plenty of stunning architecture. Also, there were Magen David’s everywhere (in the Royal Castles). The castles were pretty spectacular. In one castle, we visited an old happening room where the king celebrated and held parties. We used this as an opportunity for experiential education and learnt some traditional dancing in time for our first dinner in the country. We also visited the Fasiladas pool, in which pilgrims still take a plunge during the Timket (Epiphany) celebrations. It is a 400 year old pool with a very clever system of recycling its water. Way ahead of its time. Becca and Jessica were so excited by the videos Dejene showed them, that they asked if they could come back next year for the festival. From the pool, we went to meet the Jewish community in Gondar. They number around 6,000 people and the community is centered around a compound, which includes a synagogue, classrooms, library and a mikveh. We are planning to participate tomorrow at Shacharit T’filah and meet the head of the community who will give us a tour as well. One of the sad stories about this community is that Israel as a Jewish state does not recognize them as Halachic Jews. 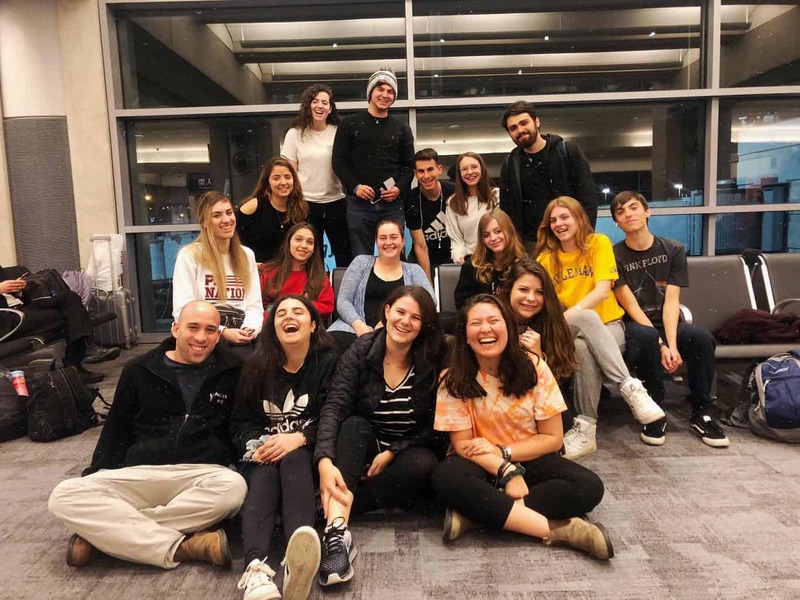 Nonetheless, these days a few of the members of the community, along with members of the Addis Abba Jewish community, are able to make Aliyah as they have relatives in Israel. You can read more about this by clicking here. We are excited to learn more about their story tomorrow and meet more members of the community. Gina Lewis also shared some of her knowledge about the history of the Jewish community in Ethiopia. She will tell us even more tomorrow during a more in-depth visit. From there, we continued on to Wolleka, a Falasha village in Gondar, where most of the Jews lived before making Aliya to Israel. It felt as if there were more Magen David’s in the village than in Israel. Our main visit was to the cemetery. As we walked in, we were stunned by the dozens of blue tombstones poking through the trees. We walked around the place, seeing Hebrew mixed with Amharic, blue and white, and stars of David everywhere. What a meaningful experience! From there we headed back to the hotel to rest and get ready for the evening. We had a traditional evening, which included local Gondar dress, music, dancing, and of course traditional food (for many people it was the first time that they tried Injera, Ethiopian bread)! It was a lot of fun and some brave souls, Mia, Hannah Saban and Hannah Philips (FYI – we have three Hannahs on the trip, cool eh? ), Gina, Ella, Ellie and Becca, used the skills they learnt in the afternoon to join in the with dancing, attempting to emulate the steps and shoulder moves that are part of traditional Ethiopian dancing. We would like to share as many pictures as we can, so please click here to see all the pictures from today and the rest of the days on our Facebook page. That’s all for today. Stay tuned for tomorrow’s update. We then continued onto the Semien National Park. The drive itself was part of the experience. Everyone was excited by the prospect of being able to sleep for 2 hours on the way up there, but the journey itself was captivating and nearly everyone stayed awake for the majority of the trip. The views were breath taking and we were able to see how Ethiopian agriculture operates. We drove through towns, villages, and countryside. Much of the time we were slaloming our way through people, donkeys, cows, sheep, goats and all manner of other obstacles and a 1/3rd of the journey was on a dirt road. Eventually we arrived at the National Park, one of the most spectacular landscapes in the world and listed by the UNESCO as a world heritage site. The Semien chain of mountains is the steepest and most precipitous on the continent and it is often compared to the Grand Canyon of Arizona. We had a nature walk within the park with a local guide, took in the breath taking views, and saw some of the wildlife, including the gelada monkey. We all started walking slowly and quietly close to them to try to get close enough for a great picture. We are pretty sure that all students got at least one picture with a monkey. We spent some time watching the monkeys in their natural habitat, interspersed with many farmyard animals. It was a strange thing to see, monkeys, goats, sheep, and horses, but it works for them. After we had seen the monkeys, we found a quiet space to eat lunch and relax after the hike. As we headed back to Gondar, we all used the driving time to nap and recharge. When we arrived back to the Jewish community, we joined them for Arvit T’filah (evening services). In the morning we met a community member name Simoni who really liked the group and wanted to tell us his story. While some of the students played with the kids and met old-new friends, David, Jacob and Simon asked to see the Mikveh and to have a dip. Our new local friend from the morning, Simoni, loved the idea and took them there. Each one of them dipped and said the blessing. When they were finished we gathered in one of the classes and heard two stories from members of the community and another story from a young Israeli girl who is volunteering there for a month and a half. The first story we heard was from a young man name Awaza who is 18 years old and originally from a village outside of Gondar. His entire family is in Israel and he has been a member of the community for the past 13 years. Next month he is making Aliyah and will be united with his family in Ramla, Ashkelon and other cities in Israel. He told us about his excitement while answering some questions from the students. He told us his date of arrival and new we are hoping to surprise him at the airport and we have promised to take him to eat his first falafel! Our friend Simoni told us the second story, and it was from a different point of view to Awaza’s. He is originally from Sudan and has been a member of the community for the past 22 years. Simoni told us about his struggle to make Aliyah and to be united with some of his family in Israel. As you already know, not all of the Gondar Jewish community are considered Jews by the Halachic standards, and therefore situations can arise, like Simoni’s, in which his relatives are Jewish by Halacha, but he is not. It is a sad but true story. He asked us, as Jews from all over the world, to help and support the community with their struggle to return to their homeland in any way we see fitting. We all hope to see him in Israel soon. Reut, a young Israeli girl who just finished army service and looked for an opportunity to do Tikkun Olam, told us the last story. She told us about the project she is part of and her role in the community. She teaches Hebrew, Torah, and prepare some of the members for Aliyah. She expressed to us the pure meaning of Tikkun Olam. We ended our day with a nice dinner at the hotel, in which we debriefed the day and celebrated Jacob and Ella’s birthday. Jaimi and Hannah Dannheisser wrote: “We expected everything to be different because we are worlds apart, but today we realized we are just the same. As we stood outside the Jewish Community Centre in Gondar, Ethiopia, we were faced with the same feeling of protection and welcoming that we feel in our Shuls at home, from the armed guards outside to the men in Kippot and Tallitot, we felt a wave of familiarity, community, and pride wash over us. We were surrounded by prayer, the same prayers that we and the rest of the Jewish people utter every day. The Israeli flags which quivered in the 7am breeze and the voices which echoed off the tin walls from beyond the compound, permeated our beings, and we were astonished to witness such similarity and devotion to the religion that we so closely align with, in a small Jewish community within Gondar. Whilst observing the service we were able to gain a glimpse into Ethiopian Jewish culture, from the new-borns to the elderly, each praying with Kavanah that mirrored that of those at the Kotel. The Aardvark boys laid tefillin with the congregation. Our 18-year-old boys were inspired to see the men on the Bimah were the same age as themselves, as they were responsible for the entire service, congregation and community engagement. 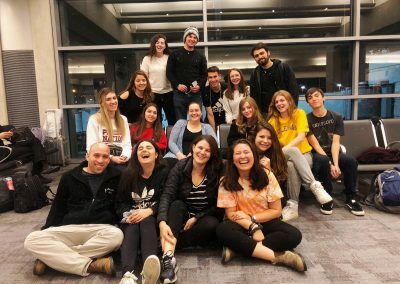 Whilst sitting in the back row observing the Shacharit service, a thirteen-year-old year turned around, smiled and gestured for us to come over. As we approached, we were stunned to hear that she was fluent in Hebrew, English and Amharic. Her name was Bamluc, she radiated beautifully spiritual energy that was louder than the silence as we stood side by side and davened, this was one of the most enlightening experiences. I would like to remind you that all the pictures are posted on our Facebook page. Please click here to view all the pictures from yesterday and today. That’s all for now. We have an early start tomorrow beginning with a flight to Lalibela. Today we left Gondar and flew to Lalibela. It was the shortest flight any of us had ever taken and we landed almost as soon as we took off. We left the airport and immediately were met with a dramatic landscape, totally different from Gondar. It looked much more like a mountainous, desert landscape and it was absolutely stunning. We drove up the mountain to the town of Lalibela and checked into our really nice hotel, we are staying in comfortable and authentic huts with balconies and gorgeous views. We checked in and got ready for the day. Hannah and Gina found out from reception that Bill Clinton slept in their room when he visited Ethiopia a few years ago. They were so happy to sleep in the same room as a celebrity! Our first stop was lunch at a local traditional restaurant and then we went on to explore Ethiopia’s number 1 site, and it’s very easy to see why it’s the number 1. The area’s history is still very much alive in the form of strange and beautiful monuments and ruins. The 11th-century rock-hewn churches of Lalibela reveal marvellous and skilful architectural knowledge from the past. These incredible edifices remain places of living worship to this day and no one visiting here can fail to be stunned and awed by the remarkable human achievements that the churches represented. There are 11 churches in total, each one is built out of one single rock or mountain, and they are connected with underground tunnels and trenches. We took pictures but I am not sure that they do the site justice. We met some priests and explored the site in its entirety. It was extremely impressive. Then, we headed to look at a stunning view from a funky restaurant where we spent our evening. It was incredible, but only Becca and Ellie had a good enough camera to really take advantage of it. We watched the sunset and ate a nice and relaxing dinner. It was very special! As we headed back to the hotel, we stopped at a souvenir store. We bought shirts and other cool stuff. When we arrived at the hotel, it started to rain, which took us completely by surprise, not just because we were not ready for it, but also due to how the weather can change extremely quickly. It was a really hot day here. Tomorrow we will continue to Addis Ababa. We are catching a flight in the morning and will start to explore our last destination in the country. Finally, the Wi-Fi in the hotel is very weak and we are trying to upload all the pictures from today. Please stay tuned. If it doesn’t work as planned then we will upload them with tomorrow’s pictures. We flew into Addis Ababa this morning and began to explore the city. Founded in 1886 by Menelik II, Addis Ababa in Amharic means “new flower” and it is a giant city that is full of people everywhere you look. It was the closest we have been to civilization since we arrived in Ethiopia, but still, there are many roads that are no more than dirt paths. We could see how the city is developing, and more modern infrastructure and buildings are built, such as roads, coffee shops and restaurants, office buildings, and even some new malls. Our first stop, after checking in to the hotel, was lunch in a more modern restaurant, which was a welcome change after four days of eating mostly Ethiopian traditional food. From there, we continued to the Ethnological Museum in the former palace of Emperor Haile Selassie. It is home to a nice exhibition on all the traditions of the country from birth to death, such as childhood, games, rites, nomadism, body culture, traditional medicine, and burial customs. In addition, we saw an exhibition on all kinds of traditional musical instruments. In the museum, we also visited the bedroom and the bathroom of the Emperor, and it is always interesting to get a glimpse of how an Emperor lives. After the museum, it was finally time to try out our bartering skills and so off we went souvenir hunting. We spent time shopping for gifts for family members and friends. As tomorrow is Valentine’s Day, Hannah Philips and Becca Carin initiated a way for all of us to remember this memorable trip and our time together. Every person in the group was assigned another person from the group and the goal was to buy a small appreciation gift. It was a really cute idea and everybody was very excited about taking part and buying a symbolic present for a friend. Then, we went back to the hotel to get ready for our evening of special traditional entertainment. The show we saw celebrated the different regions and tribes of Ethiopia by showcasing costumes, instruments, songs, and dances from each of them. Again, it was a very special night, which of course involved some traditional food. There are some cool videos of the students participating in the dancing on stage! I’ll send them in a different email. Tomorrow is our last day and it includes a trip to the Israeli Embassy, a visit to the National Museum of Ethiopia and a meeting with Dr Rick Hodes to hear his story. We will end our day by catching a flight back to Israel. I would like to remind you that all the pictures from the trip are posted on our Facebook page. Please click here to view the pictures from today and the past few days. Our last day in Ethiopia was amazing and so meaningful. While writing to you, I realize that I have used the word “meaningful” numerous times in my emails. This was the trip’s main goal – to explore and be inspired by a different side of Jewish history. We were lucky to be touched by many stories and meet local people who we will remember for many years. We started our day with zero Addis traffic and headed to the Israeli Embassy. The Embassy is a huge complex, which is used by the government and the Jewish Agency for Israel. We met Ambassador Raphael Morav just before he caught a flight back to Israel to meet his kids. He told us his story and spoke about Israel’s relationship with Ethiopia both political and economical, including International Development Cooperation, which is called the Mashav projects. Mashav is Israel’s Agency for International Development Cooperation in the Ministry of Foreign Affairs. It is responsible for the design, coordination, and implementation of Israel’s worldwide development and cooperation programs in developing countries. Mashav believes that its greatest possible contribution to developing countries can be made in fields where Israel has relevant expertise accumulated during its own development as a young country facing similar challenges. Israel has a few successful agricultural projects in Ethiopia making a huge difference, so much so that the Ethiopian Government has asked them to expand to more projects. The students asked Morav many great questions about his work and his story. Maia Blumofe asked him about the image of Israel in Ethiopia’s media and we could see how he appreciated her question. He answered that in Ethiopia Israel’s media image is more positive then Europe and in the USA and in this aspect his work is easier. Gina and Becca asked him about the current Aliyah efforts for the remaining Jews in Ethiopia, whom we met in Gondar on Monday. He said that Israel’s official statement is that they are not Jews by Halacha, BUT, there are many humanitarian cases, and Israel wants to help and save their lives, so the government is being more flexible with these cases. This was important as it completed a piece of the story that we didn’t know about. The meeting was very important to us and gave us the opportunity to learn more about Israeli diplomatic relations. It was a very interesting discussion with him and he was pleasant and friendly. We then continued onto the National Museum of Ethiopia. It was a crash course in Ethiopian history and culture. The museum houses Ethiopia’s artistic treasures. It contains many precious local archaeological finds such as the fossilized remains of early hominids. All of us were excited to see the highlight of the museum, the skeleton of Lucy, the museum’s most famous artefact. Lucy is the oldest known humanoid skeleton at 3.2 million years old. Afterwards we stopped for lunch and some quick shopping for those who wanted to buy a few more souvenirs, all the while developing our bargaining skills. We ended our day at Dr Rick Hodes’ house and heard his inspiring story. When we arrived, Dr. Hodes was still in his clinic working, so we had the chance to meet the kids in his house. There were around 20 kids and the students were happy to chat and play with them. Most of them are orphans and/or their families don’t have the resources to take care of them. Dr. Hodes and another local NGO organization help support them and their needs. After some mingling, eating pizza and some Ethiopian food for dinner, we sat with Dr. Hodes and heard his inspiring story. A spoiler alert before I begin, it is one of the best and most inspiring stories that you will ever hear. Dr. Rick Hodes is an American doctor who has lived and worked in Ethiopia for nearly 30 years. He wanted to be a doctor in African since childhood. He came as a young doctor to volunteer for a year a stayed, as you know, far longer than that. Today, he is the Medical Director for JDC in Ethiopia and has been in charge of the health of Ethiopians immigrating to Israel. Currently, he is helping to diagnose heart disease, spine disease (TB and scoliosis), and cancer. Dr. Hodes told us about his work through the stories of people whose lives he saved. Some of them were in the house, so we did not just hear about the story, we actually saw the story! His life mission contains pure Jewish values and we all looked at him as a Dugmah Eishit (a role model). We were all so amazed by it that some emotions even popped up – some of us (including myself) started to tear up. I really recommend reading more about him by clicking here. Ella Broomberg (UK) wrote, “Our final day in Ethiopia was as jam-packed as the previous four. 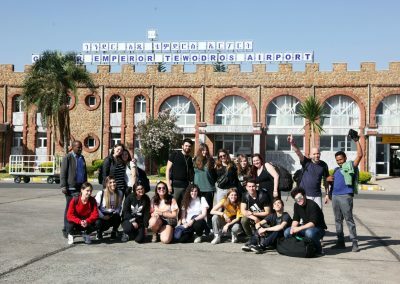 After a slightly later start than usual (thankfully we had done the last of our early morning flights), we had the opportunity to speak to the Israeli ambassador to Ethiopia. After explaining to us some of the Israeli initiatives in Ethiopia (for instance, developing their sesame trade so they could begin to export higher value goods such as Techina) as well as his own role, which also included managing relations with Rwanda. We were able to ask questions, an opportunity which we all relished given the stories we had previously heard in the Jewish compound in Gondar about individuals struggling to make Aliyah. The ambassador clarified the official Israeli position for us, explaining that though the people we had met were being allowed to emigrate to Israel on humanitarian grounds, they are technically not considered Jewish. For some of us, this position was surprising. I personally found it difficult to reconcile with the religious dedication we had seen only a few days prior. Hearing the familiar words of the Shema, in particular, had seemed to bridge the cultural gulf between us and the Ethiopians through the common medium of prayer, which to me seemed at odds with the distinction being drawn between those practicing Judaism and those technically considered Jewish. The rest of our day focused primarily on understanding the broader historical and social realities of Ethiopia. Visiting the National Museum deepened our appreciation not only of the rich cultural heritage of Ethiopia (for instance, by looking at the gorgeous Ethiopian art on display), but also the extent to which the history of humanity has its roots in Ethiopia’s ‘cradle of civilization’, as the archaeological exhibits showed the early development of humankind – we were even able to see Lucy, the earliest known humanoid skeleton. The final stop of our trip was perhaps the most memorable. A particular highlight of the trip as a whole was being able to get to know our tour guide and Aardvark alumnus Dejene, and on our final evening in Ethiopia, we went to his father’s house and for the first time began to truly appreciate the remarkable nature of both their stories. After having been orphaned at the age of 5 and contracting Tuberculosis, Dejene went to Addis Ababa where he met Dr. Rick Hodes, an American Doctor who moved to Ethiopia. Rick swiftly realized that without surgery Dejene would die, and adopted him so that he could be added to his health insurance and undergo life-saving surgery (Rick later sent him to High School in America before he took a gap year with Aardvark). Perhaps even more astonishing was the fact that Dejene’s story was far from unique – the house was filled with children and young adults whose lives Rick had saved, some of whom formed the extended family of around 20 children who live at his house. Speaking to us after we spent a couple of hours chatting to the children, Rick told us a variety of heart-rending stories about the individuals he has treated, most of whom required extreme spinal surgery. One of the most moving of these was about a patient who couldn’t afford the $20 bus fare to Addis Ababa and so walked for 8 days because he knew Rick was the only doctor who could help, relying on strangers’ hospitality for a bed to sleep in overnight. Coming from the UK where free healthcare is available and accessible to all, the lengths people went to in order to obtain treatment was particularly shocking, and having personally been a beneficiary of spinal treatment (though on a much smaller scale than Rick’s patients) through the NHS, I was able to more fully appreciate the privileges that we often take for granted back home. They are currently fundraising to help fund surgeries for other patients and you can help by clicking here. On a personal note, I would like to say that it has been a real pleasure spending these five intensive days with your children. Ethiopia is a beautiful country and we experienced a lot together. However, what made it truly special was the group of people – we had a lot of fun and really enjoyed being together. We learned a lot about the history of the country alongside the story of the Jewish communities and their traditions; met meaningful people and heard inspiring stories. We couldn’t ask for more! Thanks to those of you who have emailed me in the last couple of days. I’m glad you have all enjoyed reading about our adventures and seeing the photos! The rest of the photos from this day will be posted on Sunday. I want to give a special thanks to Charlee for all her hard work this past week and also to Dejene, our local organizer, who made sure that everything will be perfect and the students will have a great time. The students really connected to him and we all hope he will visit us soon in Israel! And finally, thanks to the students for being so amazing this week! !